Last night, we had the pleasure of being one of the first few to try out samples of the new Smoke & Spice menu items. Starting today, anyone can go in and order the items themselves. “Q”-sadilla: A flour tortilla filled with smoked pulled pork, diced onions and tomatoes, jack and cheddar cheese. Grilled and served with sour cream. Chili Sausage on a Bun: House smoked sausage on a hoagie, topped with our Smokehouse chili, and cheddar and jack cheese. 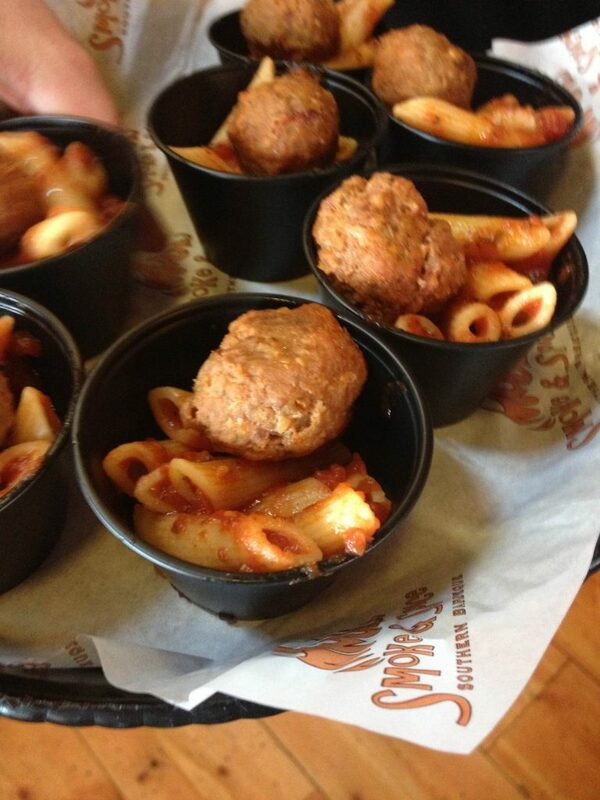 Piggy Pasta:Noodles tossed in a hybrid tomato sauce that includes our very own “Memphis Sweet” sauce. With pulled pork meatballs OR smoked sausage. Trinity Rice: A new side dish for us, this rice is seasoned with a little Creole, and features red onions, red & green peppers, corn, and black beans. I only had the opportunity to try two of the items. They were such a hit that the moment the new items were brought out to sample, they immediately disappeared. As with anything pulled pork, the “Q”-sadilla was as great as any pulled pork item you’d expect from Smoke & Spice. The sausage? Insanely good. There was just the perfect hint of smokiness to it to complement the natural flavours of the meat. Take a peek at the new menu here: View Smoke & Spice menu. If you’ve tried it and like it, leave a review! If you’re itching to try the new items, they officially launch today to the public. Go try them out and tell them WindsorEats sent you!